Everyday, you come into contact with indoor and outdoor air pollutants. These impurities can enter your body through direct skin contact, consumption of foods and beverages containing minute quantities of contaminants, and from the air you breath. These toxins and pollutants can impact your health and wellness. The symptoms may be subtle at first, depending on the environment in which you live, but over time, you are likely to find your health has been compromised. But there is an easy way to rid you body of these impurities and restore you health and wellness. A Himalayan crystal salt bath is an excellent means of body detox. Himalayan crystal salt is sourced from some of the purest sources in the world, harvested from deposits left behind by ancient oceans. 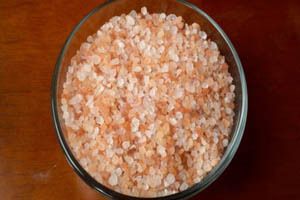 This Himalayan bath salt is extracted from the earth without use of explosive or other harsh means, ensuring the crystal structure remains intact. The crystal structure is important because the human body is also based on a crystal structure, making Himalayan salt more effective for a detox bath than other bath salt products. A Himalayan salt bath is the easy way to undergo a body detox. Pure Himalayan bath salt stimulates your body, helping to re-mineralize and detoxify your body from the outside in. In addition to their detoxification properties, Himalayan bath salt is known to provide relief from general aches and pains, while also rejuvenating the skin. You will emerge from a Himalayan salt bath feeling renewed and refreshed. Unlike conventional salt, which has been processed under extremely high heat and depleted of beneficial minerals, Himalayan crystal salt is not dried via extreme heat. This means Himalayan salt contains up to 84 trace minerals, including all those essential for your health and vitality. The salts are extremely restorative because of their mineral content. These pure unadulterated salts contain many elements already occurring naturally in the human body. That means these elements are easily absorbed and used by the body's cells. Not only can Himalayan salts be beneficial for body detox, you'll find them helpful in soothing skin allergies and irritations, whether brought on by illness, environmental toxins or aging. The minerals delivered by Himalayan salt can help sooth and heal skin problems brought on by acne, eczema, psoriasis and other conditions. Be kind to your body by using only 100 percent Himalayan crystal bath salts when choosing organic health and wellness products. Enjoy a body detox along with improved skin health and appearance with Himalayan natural salt.